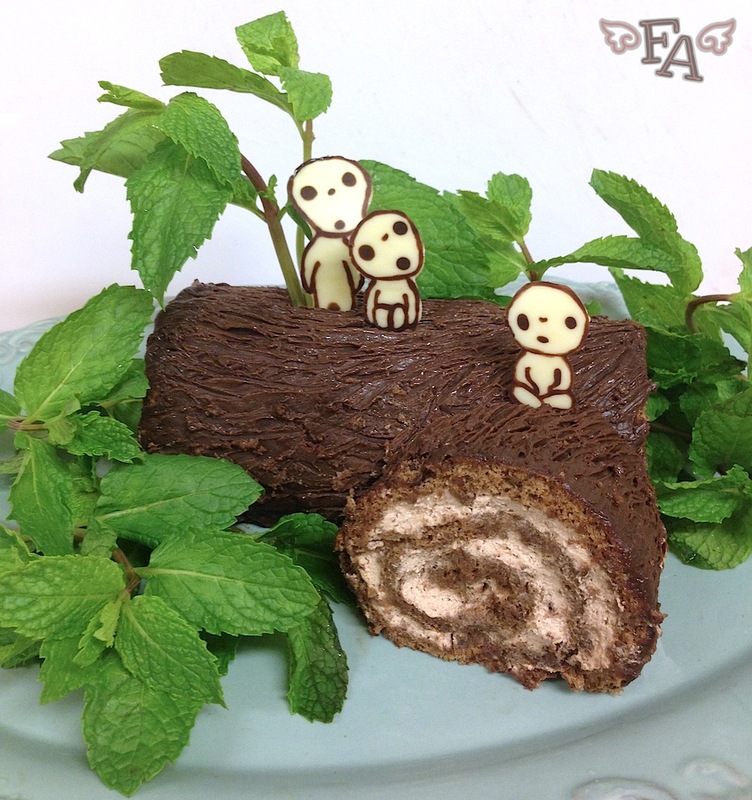 Fiction-Food Café: Kodama Log Cake for "Princess Mononoke" & "Wolf Girl"
Kodama Log Cake for "Princess Mononoke" & "Wolf Girl"
Hello all! 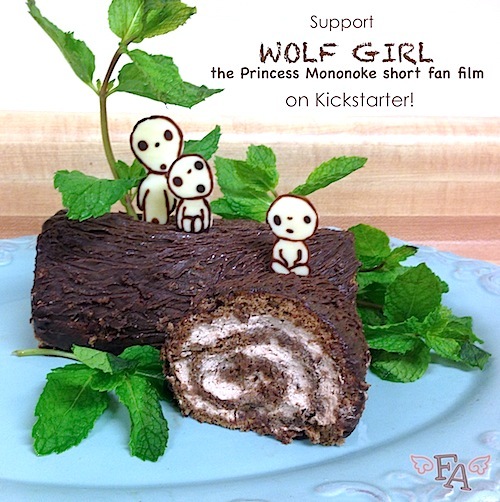 This is a special post today to support a wonderful new Kickstarter project, "Wolf Girl", a live action, "Princess Mononoke" inspired short fan film! You may know that I love Studio Ghibli films (and I think Hayao Miyazaki is one of the most brilliant, creative people ever) so when I learned about "Wolf Girl", I was instantly interested and excited. 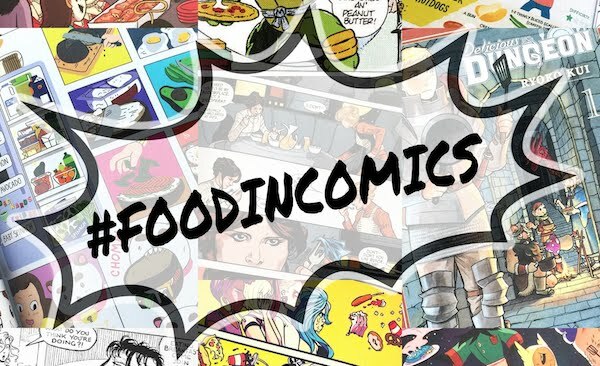 I'm so moved when a person or group of people love something so much that they strive to add their voices to the story. The concept trailer for the film looks wonderful (see below). So YOU, lovely love, can help make the "Wolf Girl" film a reality--and get some cool rewards in the process! 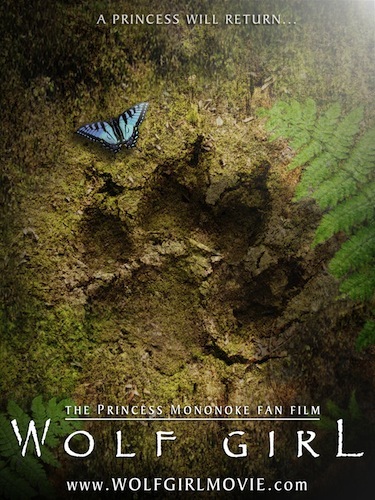 Just an FYI, "Wolf Girl" is a UK production but if you live elsewhere in the world and want to back it, Kickstarter will take care of the monetary conversions, and both the digital download & DVD/Blu-ray versions of the film will be region free so it won't matter if you live overseas! (And as always with Kickstarter projects, no money leaves your bank account unless the project is successfully funded--so it's totally safe!). 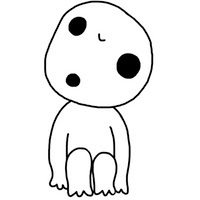 Note: Kodama are tree spirits from Japanese folk lore and feature abundantly in the Ghibli film "Princess Mononoke". 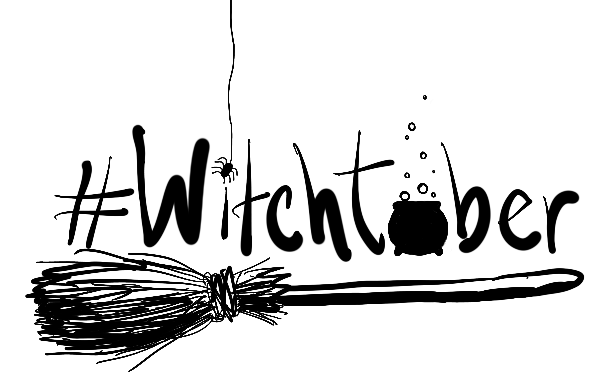 They are creepy, cute, harmless, & portentous. I used chocolate to make them for this food project, and you can create them too using the template I made here (sorry! I only drew 3!). But if you're really ambitious and have the time you could make them out of meringue--or make these cute little meringue mushrooms for decoration! Speaking of mushrooms, you could use Meiji's chocolate mushrooms (or Chocorooms) for decoration too! 1. Place your large or small swiss rolls on a tray & then put them in the freezer to chill a bit (not freeze, but get a little more sturdy). After chilling, if using a large roll, carefully slice off 1/3 of the roll & then slice the 1/3 at a diagonal to create a piece that you can place on the side of the larger roll section. Cut away a concave bit from the 1/3 in order to nestle it against the larger section more comfortably. 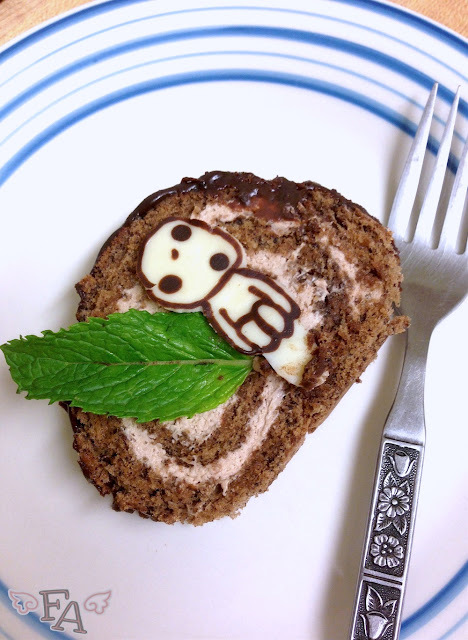 You can do this with the small swiss rolls too, minus the concave part, with some gentle squishing. 2. In a microwave safe container melt the 1/2 cup of semi-sweet chocolate chips with the tad of canola oil or shortening in 30 second intervals, stirring after each time (should take about 2 or 3 times). Pour the melted chocolate over the large or small rolls & spread to coat. If you're using a large roll & the swirls on the ends are exposed, you can leave them that way or cover them up, whatever you like. Let the chocolate sit for a moment & firm up a bit (you can put it in the fridge for a moment) & then gently score the chocolate with a fork to create faux-bark lines (see photos in this post for reference). Once the logification is complete, place the tray with the log or logs into the fridge. 3. 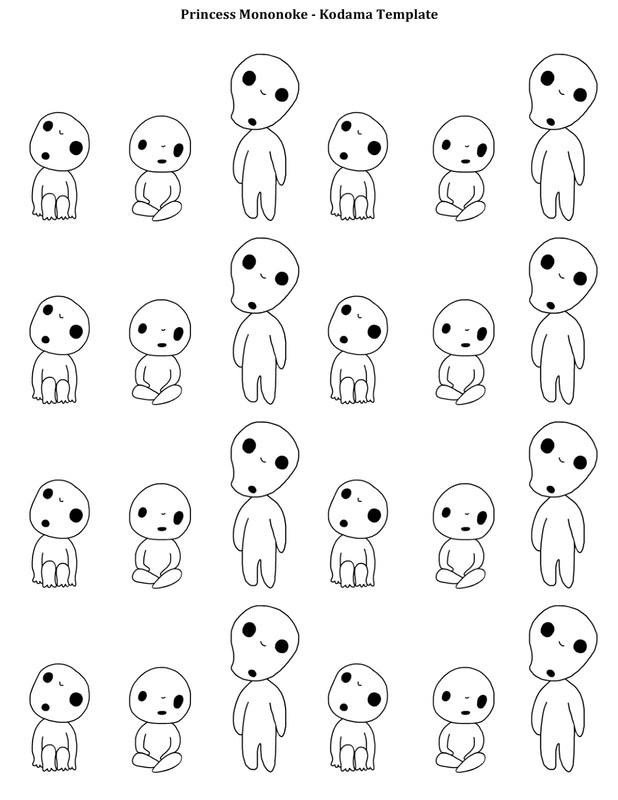 Print out the kodama template & tape it to a tray. Tape a sheet of parchment or wax paper over the template. Melt the dark chocolate. 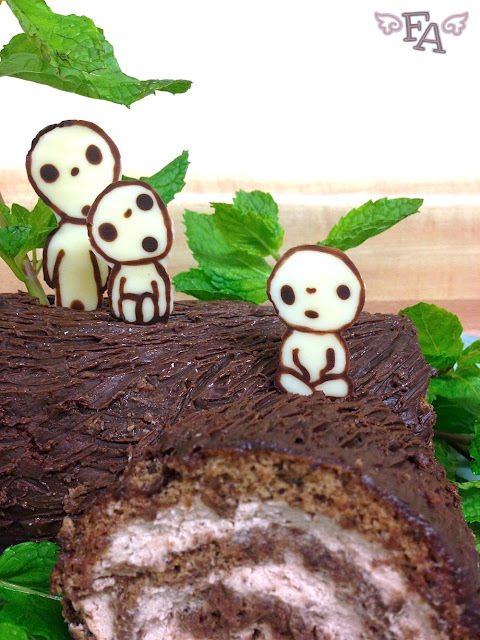 Using a toothpick, carefully & patiently trace the black lines of the kodama images using the chocolate. Place in the fridge for about 10 mins to harden. Melt the white chocolate. Gently dab small amounts of white over the kodama image using a clean toothpick, spreading the white to cover the dark chocolate only to its outer edges (not beyond) except for the very bottom of the kodamas where you need to extend the white over the outline about 1/2". This will create a section of chocolate to slide into the cake so that the kodama can sit/stand upright. Place chocolate kodama tray into the fridge for another 10 mins. or so to harden. 4. Remove the roll or rolls from the fridge & carefully transfer to a nice plate or platter. Gently remove the chocolate kodamas from the parchment or wax paper by pushing from underneath (if your hands are too warm, run them under cold water & then dry them completely). Carefully push the kodama into your roll or rolls, only up to their little feet! (making small slits in the log with a butter knife, in the spots you want the kodama to go, can help.) Place the optional mint leaves around the roll or rolls & serve immediately.